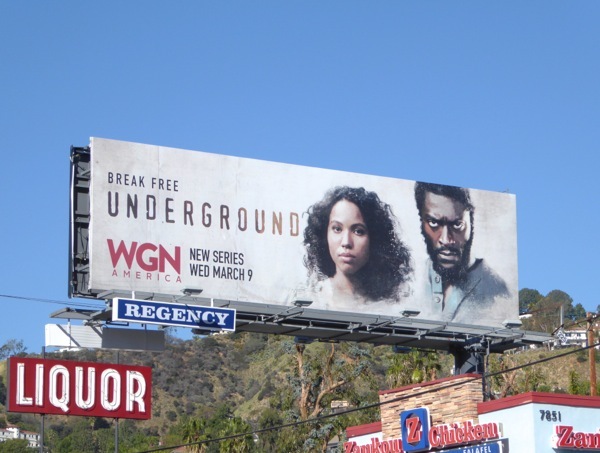 Where does your mind go when you hear a TV series title like Underground? Daily Billboard immediately thinks of shows like Unbreakable Kimmy Schmidt, or movies like Room, where women have been held captive by mad psychopaths, especially as this ad creative has a tagline like 'break free' and a man with a menacing look on his face. 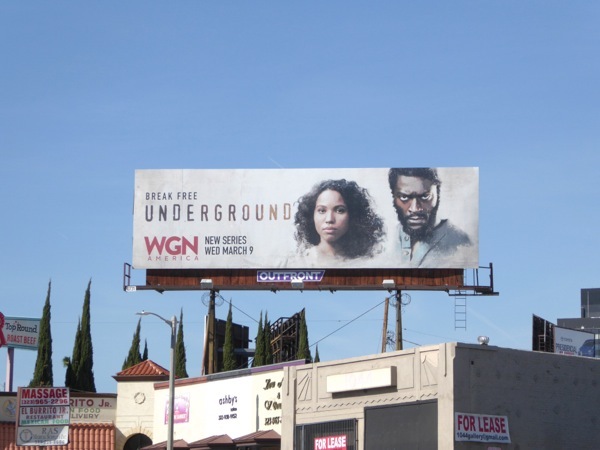 Imagine our surprise to learn that WGN America's new series Underground is actually an intriguing new historical drama starring Jurnee Smollett-Bell and Aldis Hodge. Set in 1857 America, the series follows the Underground Railroad helping black slaves escape from Southern plantation owners to a find a free life in the North. 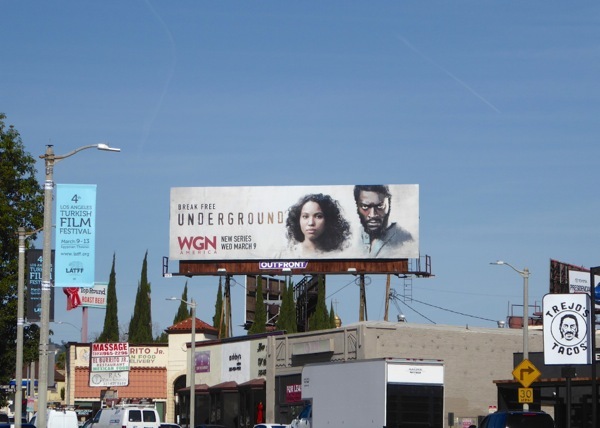 These painted-style series launch billboards for Underground were first spotted along Sunset Boulevard on February 16, then spied later above La Brea Avenue on February 24, 2016. 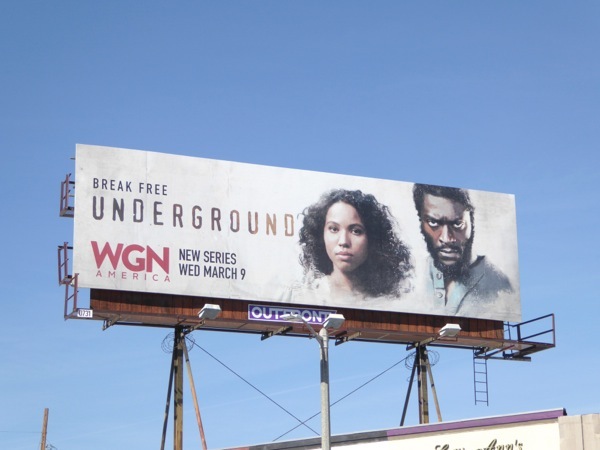 This isn't the first time that WGN America has mined the past for its original dramas, so be sure to also check out these Salem TV billboards, show about the 17th century Salem Witch Trials and these billboards for Manhattan, a series about the race to build the first atomic bomb in the 1940s. 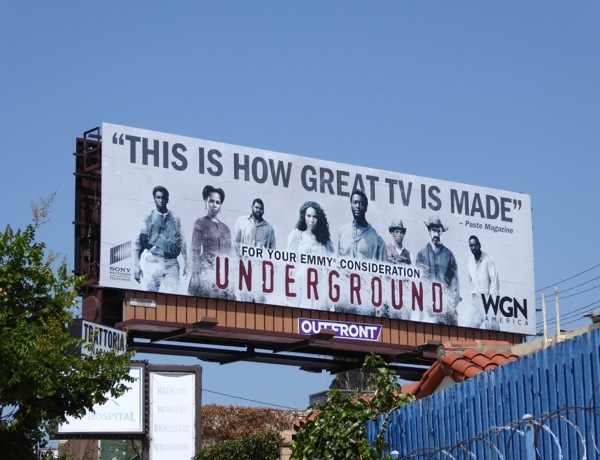 Will you be escaping modern day reality by traveling back to America's dark past and watching Underground tonight? 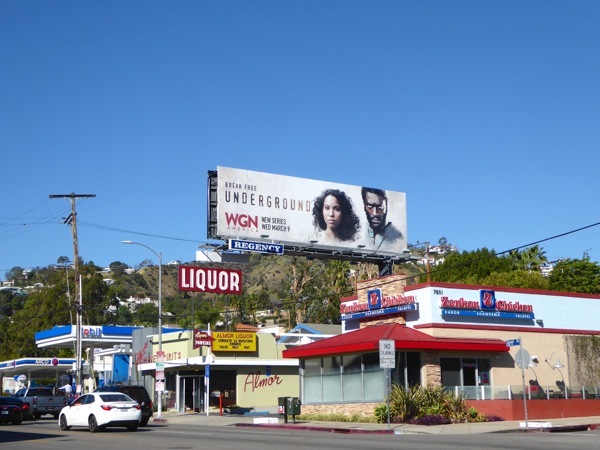 UPDATED: Here's also an Emmy consideration billboard for the series featuring the wider cast snapped along Pico Boulevard on June 2, 2016.